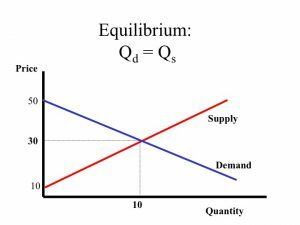 As a basic principle of economics, the relationship between supply and demand dictates price in a free market economy and in no area is it more relevant than real estate. 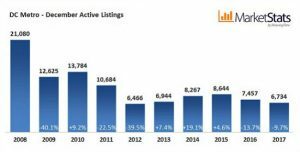 We you call me to list your home, in order to find the best price, we very specifically look at recent comparable sales. Inevitably, when housing inventory is low, high demand for what little is available on the market drives prices up. If you price your listing too low, you might get multiple offers correcting the sale price to market value. If you price too high, your listing will likely sit on the market with no offers until you correct the price to the market rate. 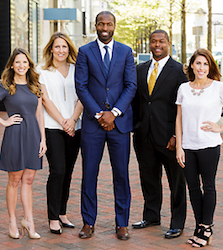 In the DC area, we have been dealing with less and less inventory on the market at the end of each year and, as we would expect, home prices have reflected that lack of supply. 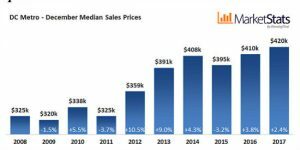 With only 6,734 active listings on the market in December, the median sales price for homes rose to $420,050, the high for the decade. Continued low inventory could keep prices high, but buyers should keep their fingers crossed that an influx of new homes on the market in the spring might stabilize housing costs a bit. If you’re looking to sell, now might be the right time. Give me a call to find out how much your home could bring in this market!